Shark Heroes II: Ocean Ramsey - We Love Sharks! Shark Heroes II: Ocean Ramsey - We Love Sharks! Ocean Ramsey is the deep-sea diver who travels all over the world to prove sharks are nowhere like the Jaws stereotype. 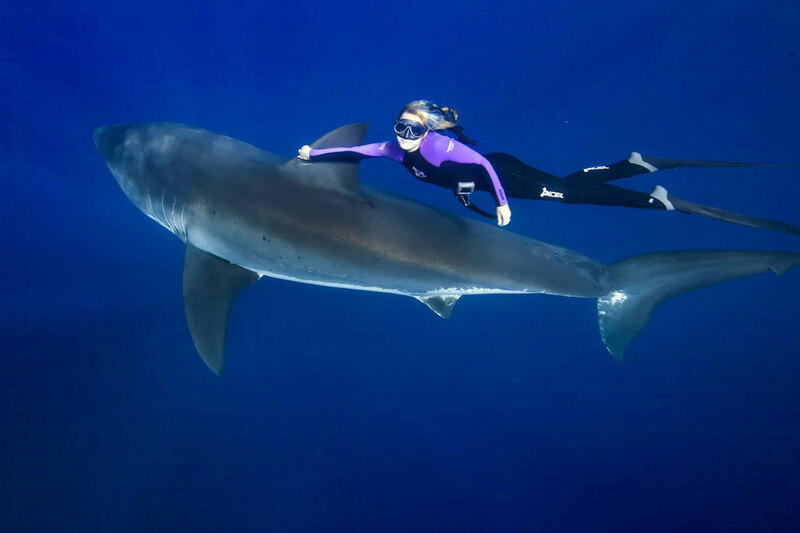 In continuation of our Shark Heroes Series, meet Ocean Ramsey. Though she probably needs very little introduction among most shark lovers. Ocean is a model with a style like no other. She started surfing at a very tender age. Also, she is a marine biologist by profession and a recipient of the GoPro Award who has found love in the ocean and in sharks. Ocean Ramsey, a professional scuba-instructor, advanced free diver and surfer, released a great YouTube video titled “A Blonde & a Great-White Shark.” The video showed her swimming in the ocean, apparently elated alongside a Great White and even touching its skin with her hands. She also held on to its fin. This particular video went viral and made her more popular than ever. She was born in 1987 in Oahu, Hawaii, USA but grew up in both Hawaii and San Diego. She got to see her first shark at the age of 8 and fell in love with the creature immediately. At age 18, she was already teaching scuba diving while still studying as an undergraduate. In her hometown, she worked daily as a free diver with sharks and she would also go out to the open ocean collecting samples. Thereafter, she launched her first program called Pelagic Animal-Research & Interaction Program. With this program, Ocean could take people out and share her experiences as a scuba trainer and diver. Below is the video of Ocean Ramsey and the Great White uploaded by GoPro Awards. Ocean Ramsey is a Marine Biologist, Associate-Master in Ethology with specification in shark behavior. That includes their body language, social hierarchy and how they interact with their environment. She also has an Associate degree in the field of psychology and behavioral science. She feels a deep passion for sharks and after she was filmed swimming alongside a huge white shark, even holding and toying with its fin, she was thrust into the public view. In her hometown, Oahu, her program aims to teach people and share her knowledge about sharks. By doing that, people may come to understand sharks better. As a result, they may learn to place more value on these predators and also dispel irrational fears. She received a GoPro and with that she filmed swimming with a great white-shark for the GoPro H.D Camera Company. In California, the state’s Fish & Game-Commission voted to consider one petition that was meant to classify the great white-shark as an endangered species. Her campaign helped bring the petition that far. Though based in Hawaii, Ramsey has dived with 32 species of sharks all over the world as of 2013. As a shark conservationist, her work focuses a lot on different sharks especially the great white sharks. Note that Ocean DOES NOT encourage everyone to swim with sharks as she admits that there will be fatalities sometimes when humans come into contact with sharks. Below is another video uploaded by GoPro Awards showing Ocean with a whale shark off the Philippines. GoPro Award that she received in 2017. Public pelagic shark-program through One-Ocean Research & Diving. A Non Profit known as Water Inspired.